Located directly in Kraków’s Old Town, Biskupia B 50 is a bright apartment with balcony for up to 4 people. The apartment consists of a bedroom with a double bed, a lounge with a double convertible sofa, a fully equipped kitchenette and a bathroom with a shower. 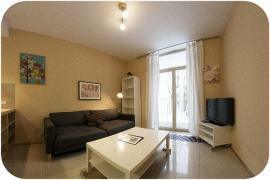 There is also a speakphone, wireless Internet access and TV SAT Premium Cyfra + in the apartment. We are offering you a breakfast with delivery to your apartment (for about 20PLN you can get scrambled eggs, eanglish breakfast or pancakes etc.). More information about menu available in the reception during check in. Our office is located in the next building (open 8:00-23:00). - Check out: till 11:00.